OK, so they aren’t raving reviews, but I love the tone…. very “can-do”. Our last two weeks were critical tests for our training and I think we all passed with flying colors. The run to Big Ben was a huge jump up in the number of minutes we ran and this week’s run was a bit quicker in pace and had some hills. For the next three weeks, we will solidify the running base that you have developed. We will slow the pace just a bit and lengthen our running intervals. This week we’ll do 8, 10, 10, 10 minute running intervals separated by walking breaks, then the following week we’re up to 11, 12, 12, 12 minute intervals separated by walking breaks. Our routes will be flat or slightly downhill. This week we are running to Whole Foods in Kensington and we’ll have our coffee there. Bring your Oyster card – we’ll head home on buses or the tube (Kensington High Street). For those of you wanting to run three times a week, now is the time to start it. You will be adequately prepared for the half-marathon running twice a week, but doing a 3rd run each week will just make things easier. If you start this, do your Thursday run with me, repeat the same run again sometime that week and your 3rd run should be 30 minutes of running broken into whatever length intervals you are comfortable with. For example, warm-up for 5 minutes walking, run 7.5 minutes four times separated by walking breaks or run three 10 minute intervals separated by walking breaks. Ideally, the running intervals would be no longer than what we are doing together (so nothing more than 10 minutes this week or 12 minutes next week). I had promised to send you some information on nutrition. I’m sure you know the basics for the general public, so let’s talk about nutrition for performance. Please accept/adopt whatever you find helpful and disregard the rest. Nutrition is quite a controversial subject – a mine-field of conflicting advice. Even top scientists can’t agree – that is why it is so frustrating for us regular people who just want to do/eat what’s right and best for our bodies. So what you’ll read below is not the gospel – it’s my opinion. I will not have my feelings hurt if you ditch these concepts/ideas. You have to experiment a bit and find out what works for you. These are my thoughts based on my own personal experiences, training people, listening to other runners at some of the events I do, reading a lot and of course, studying it when I was doing my trainer certification…. but more than anything, it’s what I’ve found works for most of our runners. Let’s start with protein because that is probably the most critical component as you increase exercise intensity or duration. When you run, you create tiny tears in your muscle fibers and protein is required to repair that damage. For female long-distance runners, experts suggest taking in about 90g a day (or 1.6-1.8g/kg of body weight). That’s a lot of protein – it takes a concerted effort to get there. Make it “clean” protein when possible – lean meats, fish, nuts, yogurt, lentils/pulses and low-fat milk (this is the one low-fat product that most nutritionists agree is fine). Most professional runners eat salmon like crazy – I’ve never heard a nutritionist say that salmon is THAT much better than other fish, but a lot of very experienced runners sing it’s praises. A lot of trainers will encourage you to increase your carb intake, but I don’t fully agree (particularly for our type of running). It may be necessary for athletes training at extemely high intensity zones, but that’s not what we’re doing. I can explain this is more detail if you’re interested, but this is the bottomline…. we are trying to teach our bodies to use fat as fuel. Fat is easier to access as an energy source and requires less fine-tuning in terms of timing carb intake during exercise. Our bodies have about 1000-1200 “easy access” calories available which will get most ladies about 10-11 miles (depending on their weight and fitness level). After that we will use gels (carbs) to fuel that last 2-3 miles of a half-marathon. If you increase your carb intake on a daily basis, then your body starts expecting a constant feed of carb fuel and may begin to resist going to fat as a fuel source. Your body needs carbs so don’t completely cut them out – just choose clean carbs, complex when possible, ie. grains, wholewheat products, basmati rice (the longer the grain the better – long grain basmati is better for you than even brown rice). Bread is not evil, just don’t rely on it as your major carb source. Sourdough bread is better for you (usually made with naturally occuring yeast) than traditional loaves. With all nutrition, the closer you can get to whole food, the better (ie. apples are better than applesauce, whole vegetables are better than pre-packaged ones). Basically, the closer your food looks to how you would find it “in-situ”, the better. That concept is one thing on which all nutritionists/dietitians seem to agree. That could be a half bagel with cream cheese, yogurt with nuts (if the nuts don’t upset your stomach), a smoothie, or try oatmeal/porridge – it wins the prize for a near-perfect carb/protein/fat mix for pre-run. Most people find simpler carbs work better before a run than complex carbs as they are more easily digested (so a plain bagel instead of a wholegrain/seeded bagel). Ideally, eat the pre-run meal 90 minutes before running. Sometimes that is just not possible, so the closer to the run that you eat, the more you should consider simplier carbs for easier digestion. The latest research on coffee/caffeine pre-exercise, suggest there is no impact on performance, but a huge impact on perceived exertion. This is interesting to me – basically these new studies conclude that given two athletes who have eaten the exact same thing, and are asked to perform at the exact same level, and who have the exact same result feel differently about how hard the session was. The one who has caffeine in their system will feel it was easier – their “perception of exertion” is lower. The protein piece is critical as is the timing of this food. Again, a nutritionist/scientist would cringe at how I try to explain this, but here we go… when you exercise your muscles are agitated/traumatized. The cell membranes temporarily become more porous (instead of a wall, it’s more like a mesh allowing the flow of nutrients easy passage). Some post-run ideas would be a latte and yogurt, a latte and a piece of fruit or a latte and half a skinny muffin. I’ve attached the Starbucks nutritional info to make this easier for you. Basically a tall, skinny latte has 15g of carbs, 10g of protein and 0g fat – so you’re looking for another 35g of carbs in addition to the latte. All of this pre/post run info would apply to longer runs and what qualifies as a long run is different from runner to runner. You are probably just fine eating whatever you normally consume until about mid-end January when our runs lengthen. Lastly, get it right about 80% of the time and you’re golden. What you’ve read above is the ideal – shoot for the ideal and accept about a B as your grade, OK, maybe a B+. An A- is definitely overachieving and a A or A+ is just downright weird. Don’t tempt yourself to become obsessive with food. It’s very common in the running world and it’s just not necessary. 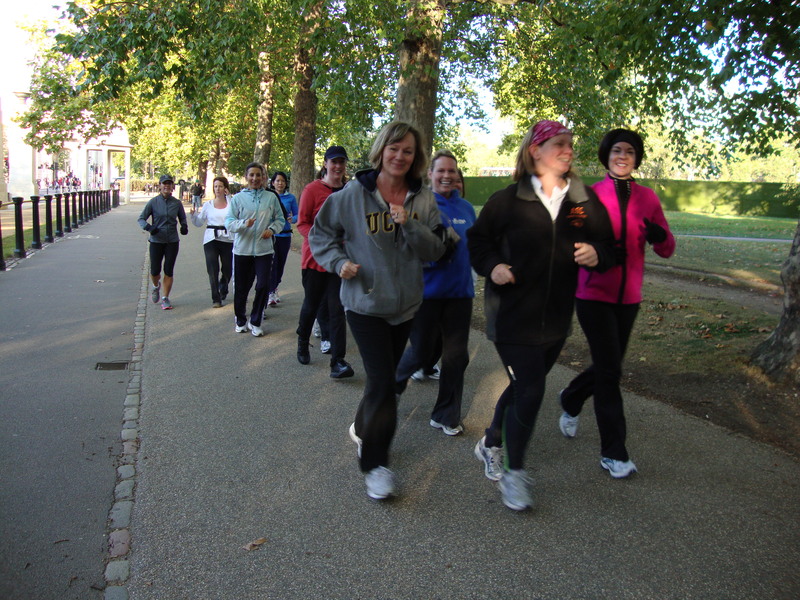 We are not Olympic athletes – we are super-fit, moms/wives/sisters/friends who run. Most of you are cooking for your family, kids, husbands and leading full lives which include meals out, evenings of over-indulgence, and times when you just don’t have the willpower to make super-healthy choices. It’s OK. If you are hoping to trim down and want help in that arena, let me know. We can make some adjustments to the suggestions above and give you a better chance of achieving that goal. Most of you will experience an increased appetite as a result of this training. That is normal. You may have heard some of our more experienced runners saying they didn’t lose a pound when they started running. Usually it’s because you’re hungrier with increased activity levels, so you eat more. It’s been my experience that women don’t lose or gain weight in training, but they have more energy, they can eat more and often digestive issues disappear. Sorry about the length of this email – it’s a lot of blah, blah, blah! Attached are a couple of photos from last week’s run – one at Big Ben and one while we were running. I don’t know what you think, but Elizabeth looks way too happy in that running photo. Do you think we should make her start carrying my backpack???? Everyone ran extremely well – that was a tough jump up in terms of running minutes last week. This week shouldn’t feel like such a stretch – I mean it’s always tough, I know, but it should feel ever so slightly boring after last week’s triumph. Be assured it’s part of the plan…. I’ll explain AFTER we run tomorrow. Next week we start going places again – so bring your Oyster card. Tomorrow we will be doing a loop back to Starbucks because many of you have children home from school and/or conferences at ASL. We will meet at the regular time, 8:15am and should be back to SJW around 9:20-9:30 depending on how many traffic lights we hit. For those of you not able to join us, we’re doing 6,7,7,7,7,6 minute intervals separated by 2 minute walking breaks. I’ll send out a bit more information this weekend about our training for the next few weeks and some nutrition tips you could consider to help you fuel these longer runs. OK ladies, you rock! We were something else this week. Extremely, extremely well done! That street running is tough but you made the transition without a problem. This Thursday our route is to Big Ben (still doing walking/running intervals). It’s our first of many destination runs where we will take the tube home instead of running a loop back to St. John’s Wood. I’m so excited I can hardly stand it. I will bring a camera and we’ll take a photo once we get down there (Elizabeth, you’ll have to resist the temptation of cringing when you see my little “point-and-shoot” camera – sorry!). Don’t forget your Oyster cards and maybe some cash – we’ll decide when we get there whether we’ll have coffee there or back at SJW. Also, another email regarding the half-marathon in Lisbon will follow this one. Sorry for junking up your in-box. The Lisbon race information emails will go to all of our running groups, not just the beginner group so I couldn’t just tack the information below. Just as a reminder, this Tuesday your running intervals are 4, 5, 5, 5, 5, 4 minutes all separated by two minute walking breaks. OK ladies, I know many of you are away on break this weekend, but I wanted to send off a congratulatory email to say “Well done”! I’ve been getting reports back in the US that you are all doing fabulously. I’m so impressed that you continue to meet up on Tuesdays on your own and it sounds like those runs are getting easier. It takes awhile to figure out who’s going to chose the route, who’s going to watch the minutes, who’s going to be the organizer making sure everyone gets out there, who’s going to be the major cheerleader, who will be providing entertainment, etc. I hope you are all settling into your various roles. I understand that maybe Bonnie and Syma made you run a bit longer than you planned this past Thursday. No worries – it’s all part of the plan. You see, when I left two weeks ago for the US, you thought I was the bad guy – now you’ll be happy to see me again! I’m much nicer than they are! We have several ladies who have joined the group while I was away. Please make note of the new distribution on this email. I would appreciate you looking over the list to make sure I haven’t missed anyone. We are a large group – I think we have 24 runners now. I imagine that we won’t have any more additions as it’s tough for a beginner to jump in now and start by running 4-5 minute intervals. With the group being this size, Bonnie and Syma will be joining us as often as they can for our weekly run. I’m heading to the airport in a few minutes. It’s been a productive trip, but let me tell you… I’m dead tired of looking at roof tiles, paint samples, wood stains, windows, doors, etc. I can’t wait to get back to London. I look forward to seeing you on Thursday. This is a big week on our schedule, but no need to fret – we’ll take it slow and easy.